The Global Volcanism Program has no activity reports for Akagisan. The Global Volcanism Program has no Weekly Reports available for Akagisan. The Global Volcanism Program has no Bulletin Reports available for Akagisan. The broad, low dominantly andesitic Akagisan volcano rises above the northern end of the Kanto Plain. It contains an elliptical, 3 x 4 km summit caldera with post-caldera lava domes arranged along a NW-SE line. Lake Ono is located at the NE end of the caldera. An older stratovolcano was partially destroyed by edifice collapse, producing a debris-avalanche deposit along the south flank. A series of large plinian eruptions accompanied growth of a second stratovolcano during the Pleistocene. Construction of the central cone in the late-Pleistocene summit caldera began following the last of the plinian eruptions about 31,000 years ago. During historical time unusual activity was recorded on several occasions during the 9th century, but reported eruptions in 1251 and 1938 are considered uncertain. Kobayshi K, Nakamura E, 2001. Geochemical evolution of Akagi volcano, NE Japan: implications for interaction between island-arc magma and lower crust, and generation of isotopically various magmas. J Petr, 42: 2303-2331. Moriya I, 1970. History of Akagi volcano. Bull Volc Soc Japan (Kazan), 15: 120-131 (in Japanese with English abs). Murayama I, 1989. Volcanoes of Japan (II). Tokyo: Daimedo, 285 p (in Japanese). Suzuki T, 1990. Tephrochronological study on the 200,000 years eruptive history of Akagi volcano in north Kanto, central Japan. Chigaku Zasshi (Jour Geog), 99: 60-75 (in Japanese with English abs). There is no Deformation History data available for Akagisan. There is no Emissions History data available for Akagisan. The broad low volcano of Akagi at the northern end of the Kanto Plain contains an elliptical, 3 x 4 km summit caldera with post-caldera lava domes arranged along a NW-SE line. Lake Ono, seen here from the SW with the summit of the volcano at the upper right, occupies the NE end of the caldera. Most of the activity of Akagi occurred during the Pleistocene, when a series of large plinian eruptions accompanied growth of a second stratovolcano. Only one somewhat uncertain eruption was recorded in historical time, in 1251 CE. 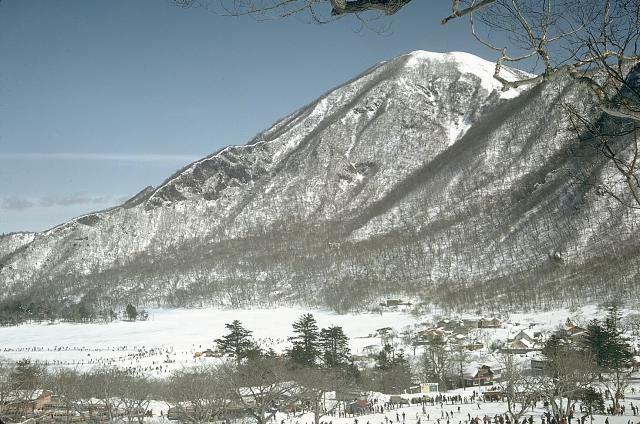 The lake-filled summit caldera of Akagi volcano is a popular winter skiing and ice-skating destination for residents of Tokyo and surrounding areas. 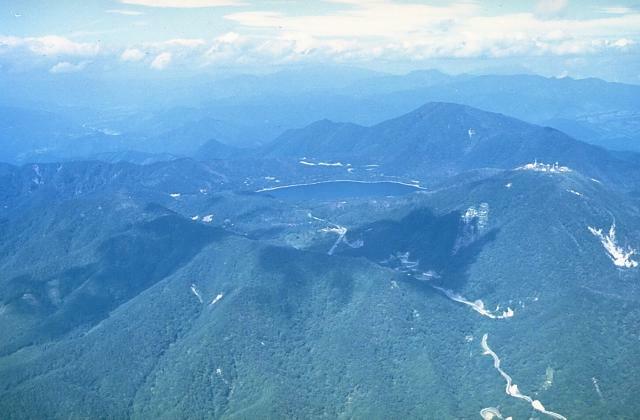 Kurohinoki-yama, across Lake Ono to the NE, is the highest point on the caldera rim of Akagi, 350 m above the lake. Photo by Lee Siebert, 1965 (Smithsonian Institution). There are no samples for Akagisan in the Smithsonian's NMNH Department of Mineral Sciences Rock and Ore collection. Large Eruptions of Akagisan Information about large Quaternary eruptions (VEI >= 4) is cataloged in the Large Magnitude Explosive Volcanic Eruptions (LaMEVE) database of the Volcano Global Risk Identification and Analysis Project (VOGRIPA).